Randal had the privilege of designing one of The Pampered Chef’s earliest printed brochures featuring the kitchen products they were selling in the early 1980’s. 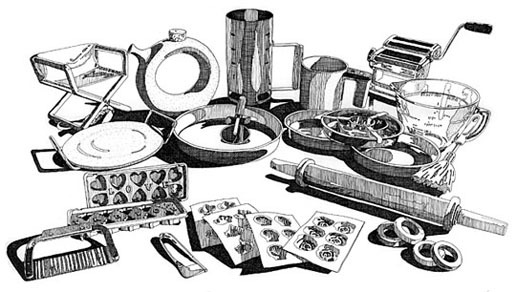 This line illustration was done by hand based on photos the illustrator took of the kitchen products. It was used on an interior brochure spread with product names and descriptions located around it. Randal also cleaned up the Pampered Chef logo art and added a more contemporary typeface to the piece. It was printed in 2 colors on heavy brown Kraft style paper.